Quite recently there has been a wave of controversy surrounding the validity of high THC content cannabis testing results, where a few % points one way or the other can have real ramifications when it comes to selling or buying the flower. So why are we witnessing higher THC content levels and are they real or a hoax? Ironically there is a government-funded longitudinal cannabinoid content study that continues today at the University of Mississippi that we can refer to in an effort to look into what has been happening with THC content levels over time. From 1980 to 1997, a total of 35,213 samples of confiscated cannabis products from almost 8,000 tons seized in the US have been analyzed for mean THC content. The lowest levels measured increased from 1.5% to 4.2% over the 17-year time period and the highest levels found were from 29.9% to 33.1% in sinsemilla. So obviously there has been a very strong trend toward higher THC levels. And there are reasons for the increased potency including active breeding programs, indoor cultivation, hydroponics, advanced pruning techniques, and access to seeds from high-THC cultivars on the Internet from around the world. There are also variables surrounding how cannabis testing labs extract, measure and report cannabinoids which I will not delve into here except to say that proper calibration of analytical instruments is key to ensure that the cannabinoid levels observed fall within the dynamic range for that cannabinoid for accuracy. Reporting of THC levels can also lead to confusion, defining THC as a specific cannabinoid, THCA or delta-9-THC, or as a catchall bin, or the taboo of providing a total cannabinoid content number depending on how many different cannabinoids a testing lab is certified to analyze for. Cannabinoid content can easily vary by four orders of magnitude. Simplistically it was assumed that this variation could all be traced back to differences in the two known cannabinoid synthase loci, THCA synthase and CBDA synthase, the former leading to high-THCA and the latter to low-THCA and higher CBDA content. Comparative genetics between high-THC narcotic cannabis strains and low-THC industrial fiber hemp strains, strongly suggests that the absence of a functional CBDA synthase gene is essential for high marijuana potency. Yet, we now understand that the quantitative THC differences observed among cannabis cultivars can not be explained by cannabinoid synthase loci alone but rather suggests independent assortment of drug quality and quantity. This means that there are other genetic factors at play and in fact, morphological differences in the glandular trichomes amongst cannabis cultivars evidently play a much larger role than ever imagined. 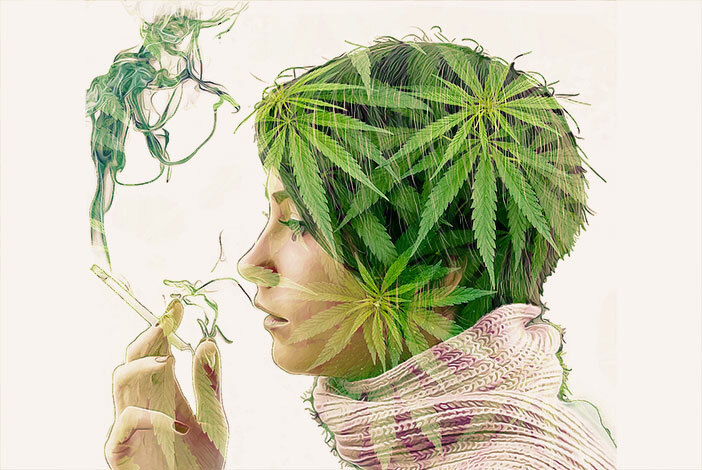 THC is synthesized and stored in the resinous, glandular heads found on the surface of marijuana plants, predominantly localized on pistillate flowers. Curiously, it has very recently been proposed that the diameter and abundance of these glandular organs, which exponentially shrink and decay with time, could be used to distinguish high-THC content narcotic cannabis strains from non-narcotic, industrial hemp like strains. These glands vary greatly in height and volume. The volume of resin heads from narcotic strains are more than four times that of industrial hemp strains. Gland size tends to be quite heterogeneous, reflecting a lack of genetic stabilization for this trait; no doubt due to recent breeding activities selecting for high cannabinoid content but without rounds of backcrossing to stabilize the genetic basis for this morphological trait. While the functions of enzymes involved in cannabinoid biosynthesis that apparently evolved by gene duplication are obvious candidates for selective breeding efforts and in vitro genetic engineering, there are obviously more genetic traits required to gain stellar, 30% and above THC levels which are very real indeed. While we do not know a theoretical absolute maximal THC content number possible for a cannabis bud, 30% is definitely not the ceiling but more in the range of 35%, it is getting close. At DigiPath Labs, Las Vegas, where we have now analyzed over 700 cannabis flower samples, all grown indoors, we typically see THCA levels in the high 20% range; but have occasionally observed THCA content above 30%, in particular a True OG cultivar grown by Polaris was determined to have 35.9% THCA and delta 9-THC of 0.7%, giving a total potential delta 9-THC of 32.2% following decarboxylation. The future of high-THC narcotic cannabis cultivars has arrived! de Meijer et al. (2003) The inheritance of chemical phenotype in Cannabis sativa L. Genetics 163:335-346. Small E, Naraine SGU (2016) Size matters: evolution of large drug-secreting resin glands in elite pharmaceutical strains of Cannabis sativa. Genet Resour Crop Evol 63:349-359. Weiblen GD, et al. (2015) Gene duplication and divergence affecting drug content in Cannabis sativa New Phytologist 208:1241-1250.